If these themes sound ominous and serious, our means of engaging them is not. We use every imaginative means at our disposal to help adolescents experience and express their lives creatively. We make masks. We play improvisational games. We make maps of our lives. We imagine ourselves as heroes on our quests and draw and write about what we find along the way. We create sharing circles to deal with the difficult struggles of growing up. What we don't do is judge, analyze or criticize. Ever. The Journey is roughly 40 hours of experience, broken into the five phases mentioned above. Written in 1987, some 50,000 copies have been sold, for use in 43 states and six foreign countries. Those guiding the program have found myriad uses for The Journey. It has been offered as curriculum in middle and high schools and colleges. As summer camps. As a therapeutic tool in mental health treatment centers. As a "wake up call" to young people in trouble with the law for the first time (first offender programs). 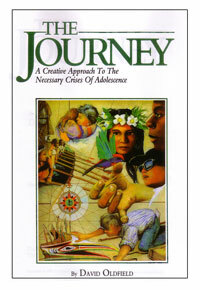 As the basis for spiritual growth and development in confirmation classes and religious education.